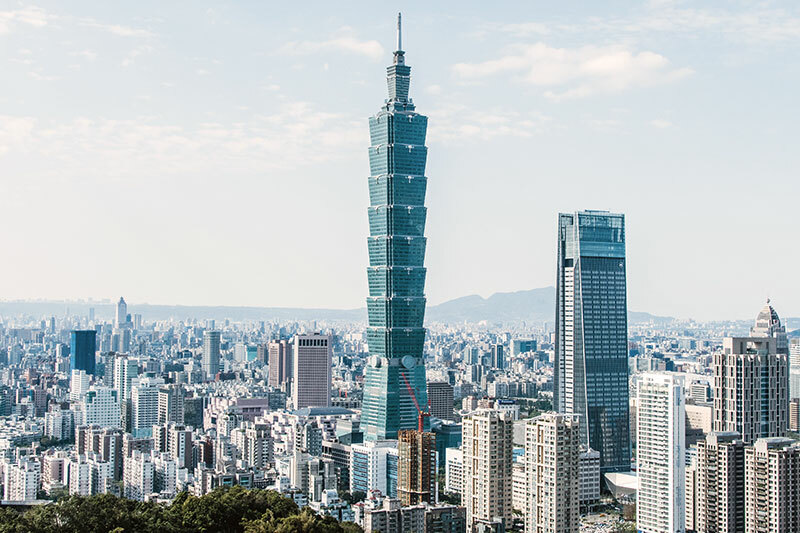 Taiwan is one of the friendliest places to visit and has everything you could want, from a bustling metropolitan to a gorgeous national park. Even without knowing much Mandarin, you can easily find your way around as English signs are readily available. So, grab a card for the metro and you’ll be able to zip across Taipei to check out all of its wonders. The metro is also air-conditioned, making it a welcome refuge during the more humid Summer months. You can then grab the train to skip across to other sides of the island. 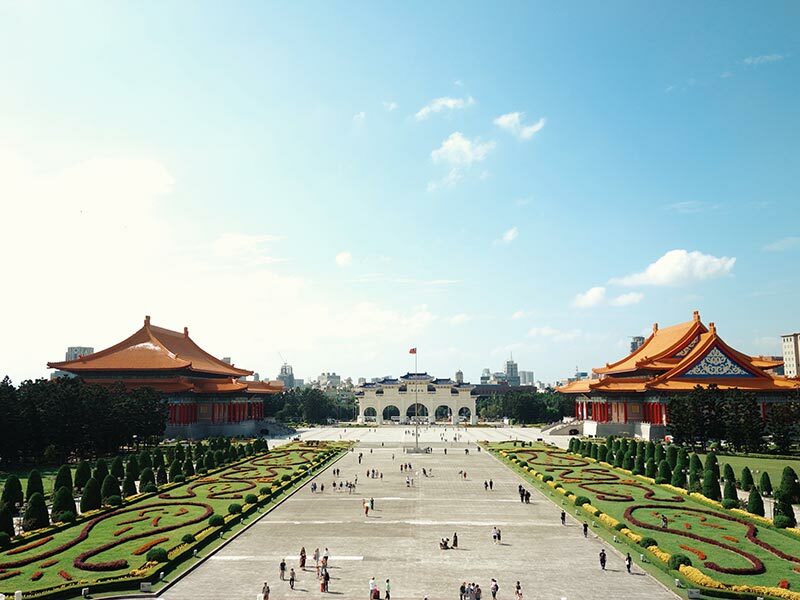 Here are 10 top things to see and do when visiting Taipei and Taiwan. Taipei 101 is the iconic skyscraper you’ll see in any illustration of the city’s skyline. Previously one of the world’s tallest buildings, the highlight is its observation deck from which you can see the entire city. Matching the beautiful view of the outside is a chance to see the internal structure of the building. Check out the tuned mass damper, a pendulum that helps counteract swaying from strong winds, and take a selfie with its very own mascot, the Damper Baby. 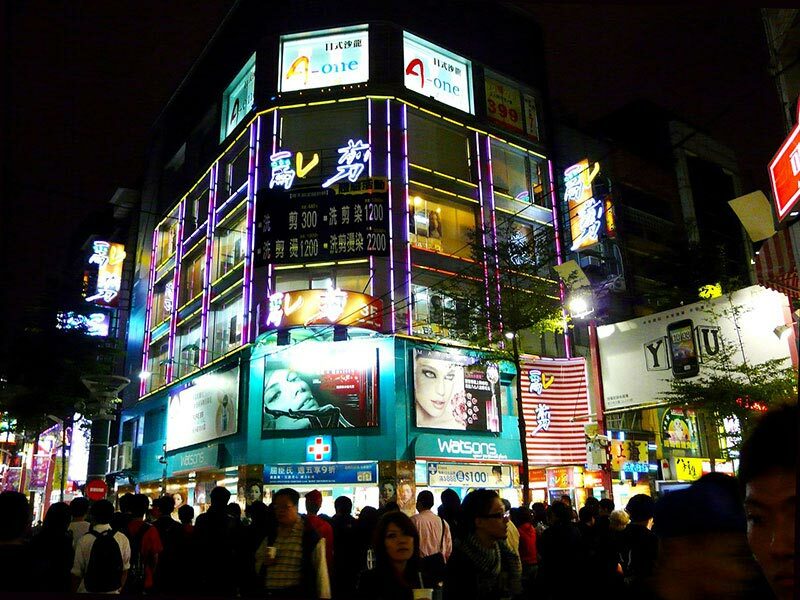 Stop off at the Ximen station to see Taipei’s answer to Japan’s infamous Harajuku district. Best seen at night, you’ll find the more unusual buskers performing alongside numerous bars, shops, collectable stores and more. Hit up PartyWorld for karaoke, or see a movie at any one of the numerous cinema houses along the way. Ximending is also home to the Red House Theatre, which sits alongside Taipei’s largest LGBT scene. 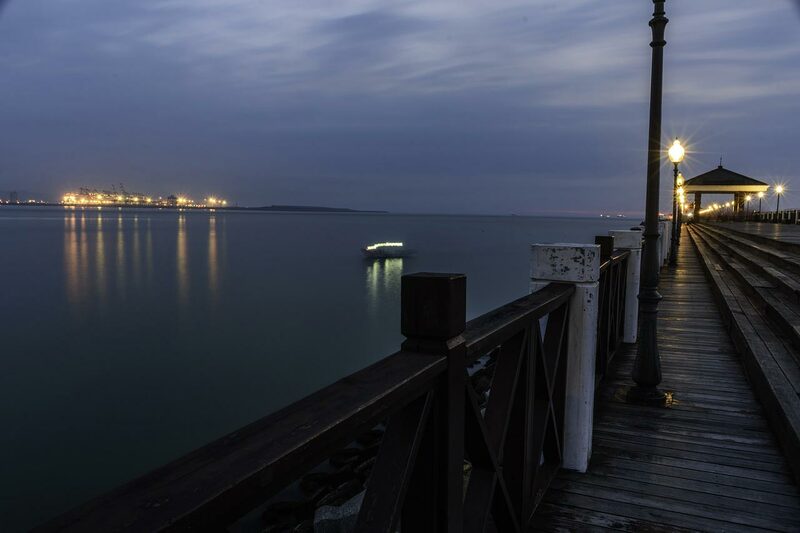 Visit the boardwalks of the Tamsui district along Taiwan’s northern coast. You can rent a bike or stroll along the boardwalk area to see plenty of local shops and food stands. Across the Tamsui river, you can see the Bali district. It’s said that If you look out at Bali from this side of the river, Guanyin Mountain looks like the Buddha Guanyin lying down. Located in Zhongzheng District, the Chiang Kai-shek Memorial Hall contains a statue memorializing Generalissimo Chiang Kai-shek, the former President of the Republic of China. If you visit on the hour, you’ll be able to watch a changing of the guard before the statue. As you leave the room, you’ll be treated to a beautiful view of the Memorial Hall–an incredible photo opportunity not to be missed. The Memorial itself is full of symbolism and gorgeous architecture, and adjacent buildings contain the National Concert Hall and National Theater. If you’re looking for a place saturated with historical significance, this is the spot. 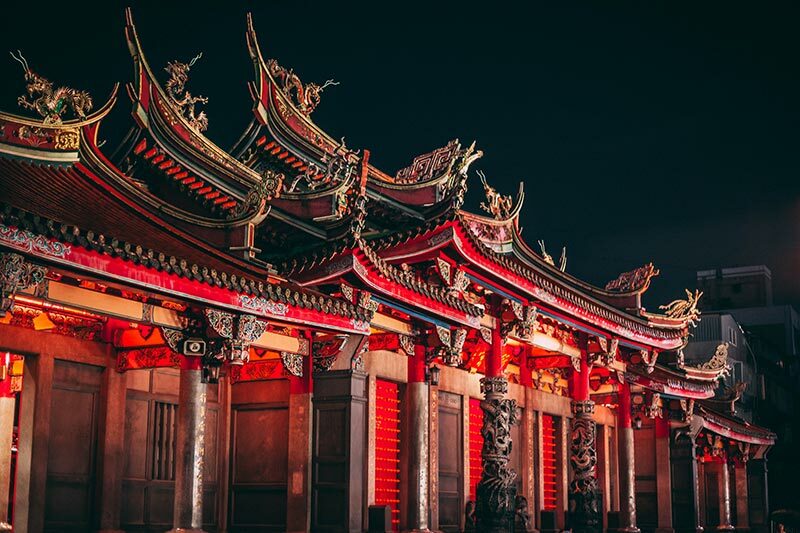 Longshan Temple is one of the busiest temples in Taipei, and is also the largest. It’s a beautiful temple area, and as tempting as it will be to take photos inside of the temple space, this is considered extremely rude. 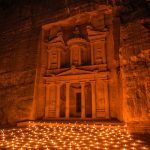 If you’d like to participate in some way, you can typically buy a bundle of incense to light and leave a few burning sticks in the sand. 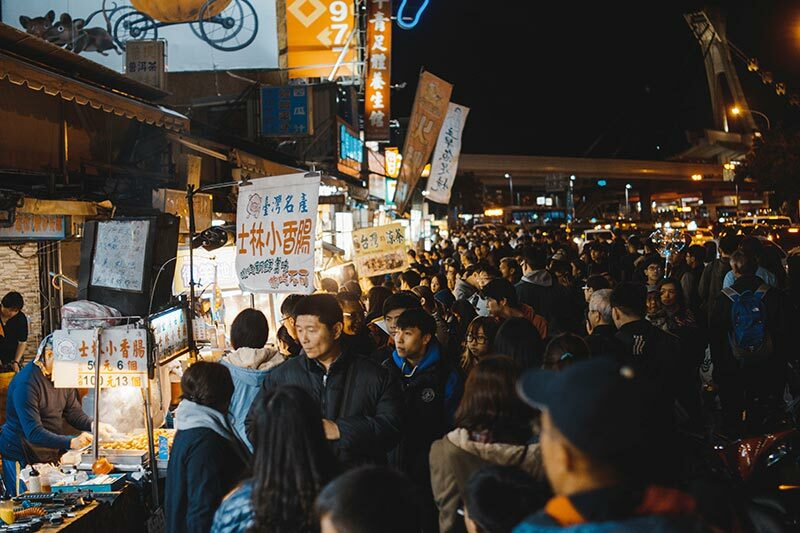 No trip to Taipei is complete without visiting one of the many night markets that spring up throughout the city. Tons of shops and food stands are set up along the walkway, and the streets are often quite packed with both locals and visitors. If you’re very adventurous, you can even try grilled snake from one of the food stands. 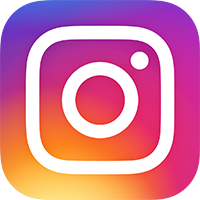 For unique gifts or just to people watch, this is the place to be. 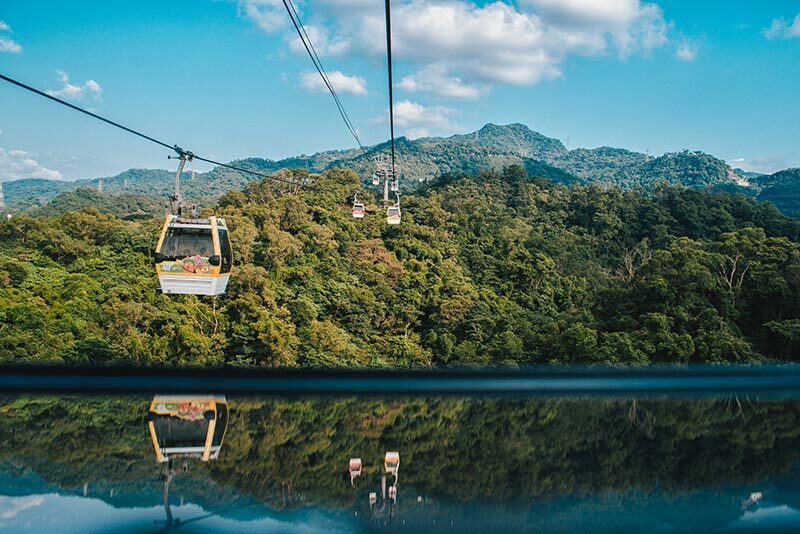 Although you’ll take the metro to the Taipei Zoo station, we would strongly recommend taking the Maokong Gondola. Braver travellers can opt for a glass-bottom ride up to the tea plantations just up the mountain. You’ll get a beautiful birds-eye view of the city as you ascend up the mountain. Once there, you can wander around the various tea houses and food stands. Enjoy a cup of hot tea as you look out across the mountaintop for a more meditative experience. 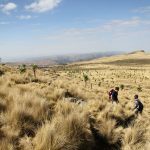 It’s a less crowded, less metro area so that you can get a feel of being in the country without having to go too far out of your way. If you’re a Studio Ghibli fan, this is a must-see, and it’s only a short bus ride away from Taipei. 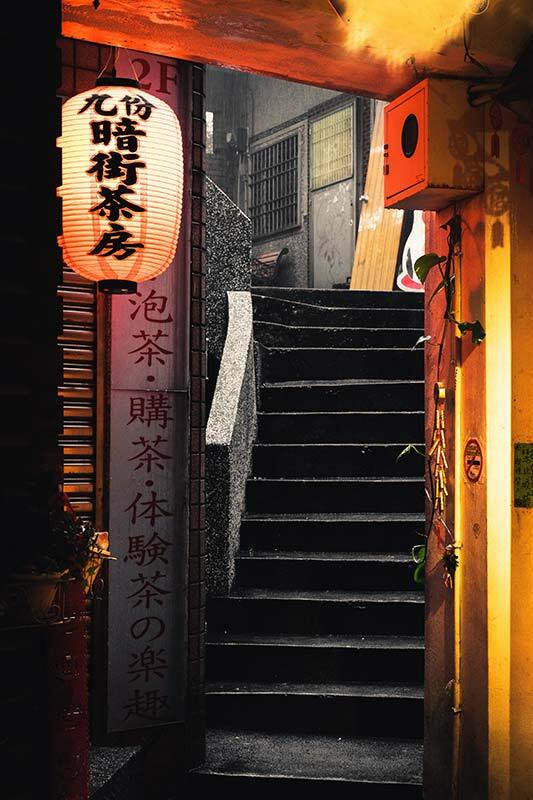 While Miyazaki doesn’t acknowledge Jiufen as the inspiration for Spirited Away, you will definitely feel like you’ve stepped into the movie as you traverse the narrow alleys and stairways of Old Market Street. You won’t be able to turn around without some new novelty food or an interesting toy catching your eye. There are tours available, but it’s best experienced by wandering around on your own. If you’d like a place to stop and people watch, the Sky Castle Teahouse is one of the top teahouses in Jiufen. If you ask nicely, they may bag up any unused tea leaves for you to take with you! 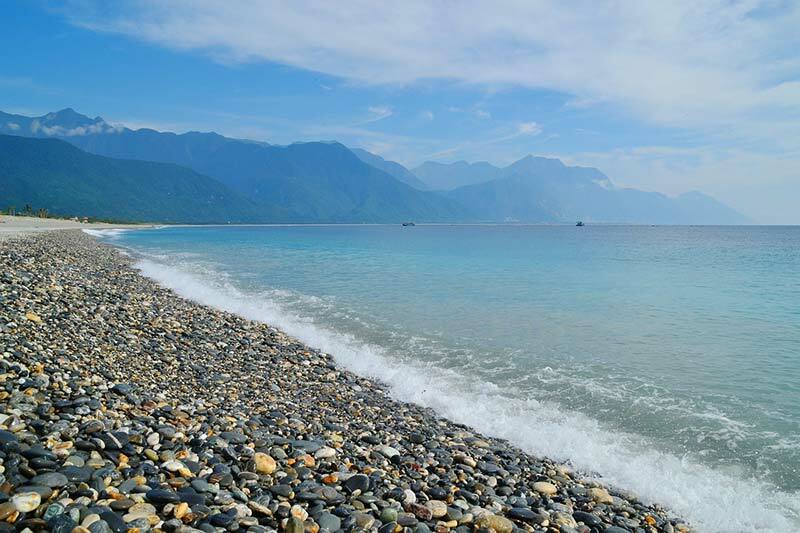 Hualien is a coastal town south of Taipei and can be reached by bullet train within a couple of hours. Although it was impacted by a large earthquake in 2018, the city has recovered and is now a great spot to visit (and help by contributing to the local economy). It’s a great place to rest up for Taroko National Park, and there’s plenty to enjoy in the town as well. It’s also a biking hot spot, as Hualien has a long, well-maintained bike path along the waterfront, as well as a great boardwalk with carnival games, photo opportunities, and plenty of local food. It won’t be difficult to spot the giant statue of the goddess Mazu overlooking the sea. 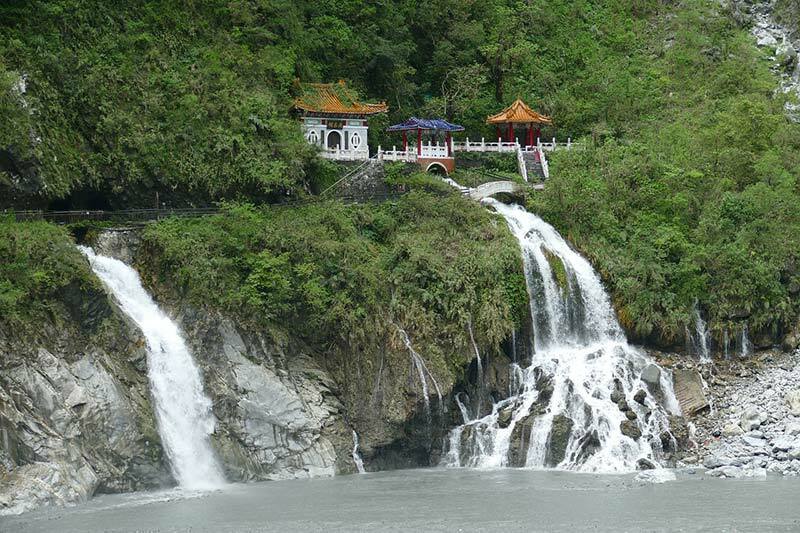 Walk the trails along Taroko’s 19km long canyon to see the hundreds of shrines dotted along the gorge walls. Stop off at the Eternal Spring Shine and traverse the hidden tunnels behind an ancient temple, or grab a hard hat to cross the suspension bridge at Old Zhuilu Trail. This park has tons of trails, both short and long, and you can jump on and off the bus at each trailhead. You can reach the park by taking the train from Taipei City to Hualien, then grab a seat on the local bus that runs through the park. 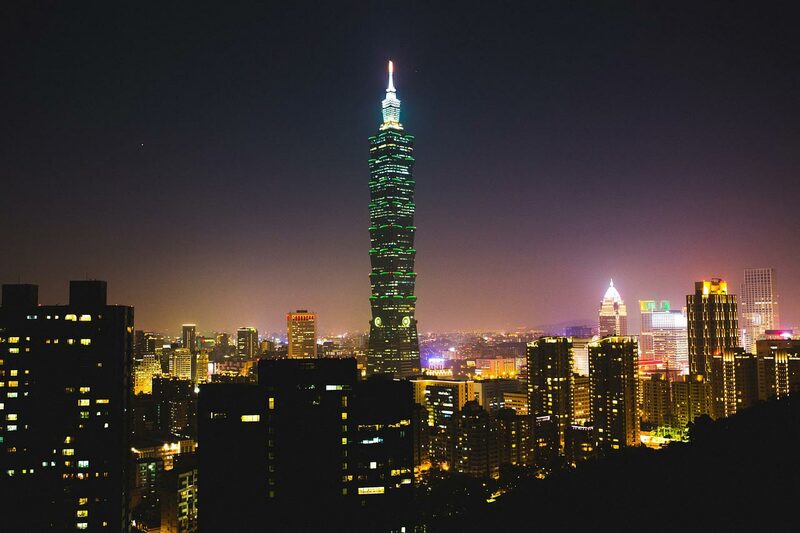 Hey Buddy!, I found this information for you: "10 Top Things to See and Do in Taipei and Taiwan". 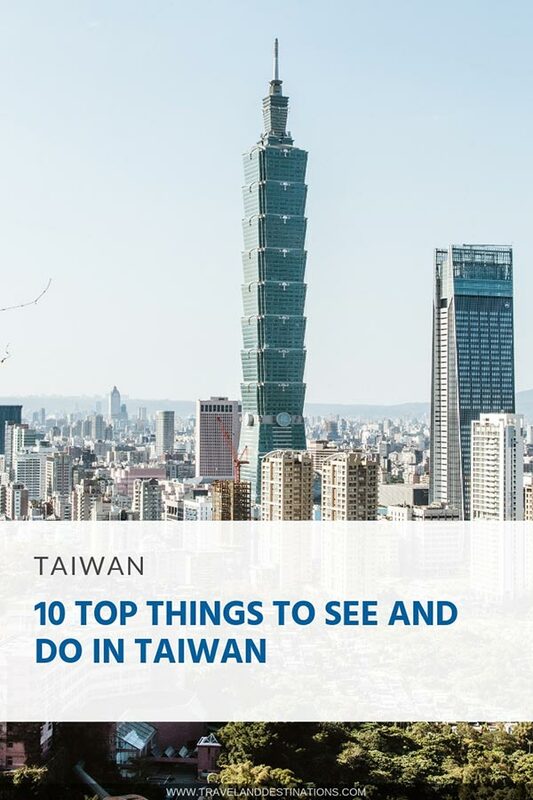 Here is the website link: https://www.travelanddestinations.com/10-top-things-to-see-do-taipei-and-taiwan/. Thank you.